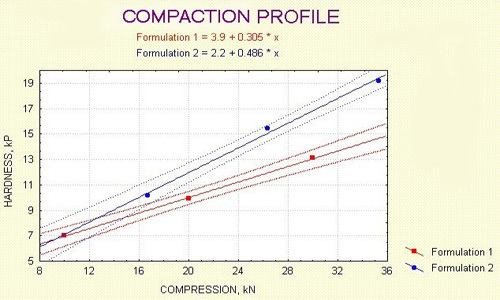 When the average tablet hardness is plotted against the average compression peak force, we get the so-called compaction profile that allows us to compare different formulations or different processing speeds. On the screen, which formulation is better? Well, formulation No. 2 makes harder tablets for the same compression force, and this would mean less wear and tear on the production press is required to achieve desired hardness. On the other hand, if your hardness tolerance limits are exceptionally narrow, the steeper slope of formulation No. 2 may be a detriment.